Vacation rental house. Sleeps 16, 6 bedrooms, 4.5 bathrooms. No pets allowed. Entry into the recently renovated beach house at #8 Egret Street brings you to the newly furnished Living Room. All new furnishings, wood flooring and finishes make for a pleasant greeting. The large Family Room adjacent to the kitchen has ample space for the family to gather. This large space is great for family gatherings while watching television or getting cozy next to the fireplace.There is also a view through the French doors to the very large outdoor heated pool. This large space is great for family gatherings while watching television or getting cozy next to the fireplace.There is also a view through the French doors to the very large outdoor pool. This space adjoining the Family Room has seating for 6 to 8 persons and looks out to the screen porch and pool area. All new kitchen with all new appliances, cabinets and flooring. New stainless appliances, furniture quality cabinetry and wood flooring make this a cook's dream. Fully equipped for your every culinary desire. The king bedded Master Bedroom is just off the entry and main living area. This room has loads of closet space, private bath and views out to the pool area. The compartmentalized Master Bath has a marble topped double vanity, all tile floors, and a glass and tile walk-in shower. The bunk room with four single beds is the ideal spot for the kids. All new bedding on these bunk beds makes for a comfortable night's sleep. This bedroom with access to the hallway bath features a king bed and overlooks the front lawn. Ample closet space completes this area. The hallway bathroom with glass walk in shower and double sink vanity and granite counters give access to the bedroom #3. The 4th bedroom in the main house at 8 Egret has a queen bed, access to the hallway bath and views out to the front landscaping. Just off the Family Room/Dining Area is a screened in porch for your enjoyment. This very large area features a wall mounted 55" flat screen television, casual outdoor furniture and looks out over the available heated pool and the rear lawn. Just off the Family Room/Dining Area is a screened in porch for your enjoyment. This very large area features a wall mounted 55" flat screen television, casual outdoor furniture and looks out over the available heated pool and the rear lawn. The long angled bar make this the perfect entertainment area. Just off the Family Room/Dining Area is a screened in porch for your enjoyment. This very large area features a wall mounted 55" flat screen television, casual outdoor furniture and looks out over the available heated pool and the rear lawn. The long angled bar make this the perfect entertainment area. With available table and seating this makes for the ideal spot for alight lunch or refreshing beverage while watching the kids splash in the pool. The very large outdoor pool and surrounding deck is adequate for lots of outdoor fun in the sun or an intimate evening soiree. There is the availability to have the pool heated upon request. The balcony of the guest house allows you to relax in the rocking chairs while looking out to the pool. The newly renovated living room area on the second floor of the Guest House features 2 day beds for additional sleeping areas. The newly renovated living room area on the second floor of the Guest House features 2 day beds for additional sleeping areas. This space also features an efficiency kitchen and dining area. New efficiency kitchen in the guest house makes this space self sufficient. All appliances, cabinets and counters complete this area. Bright powder room with Tub/Shower combination. King size bed with wall mounted smart flat screen T.V and closet space. Beautiful beach house steps to beach. Pool in back of house with screened in porch with bar. The beach house on 8 Egret street near Coligny Plaza is 3 minute walk to beach!! Front entrance to fully furnished Charming bright house. Gas grill for your Vacation cooking! Screened porch and guest house. 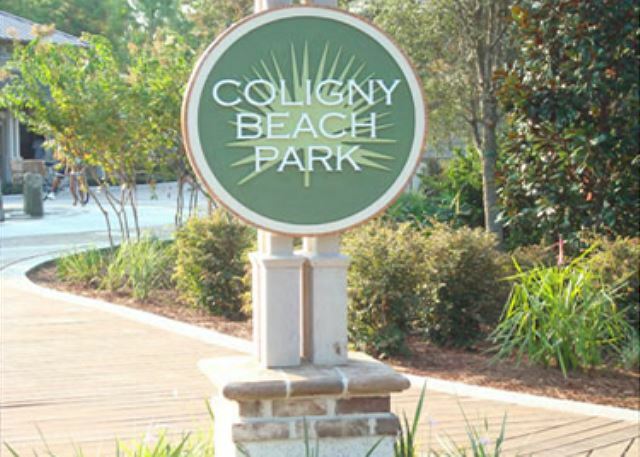 The Coligny Beach Park fountain which is fun for kids is just a three minute bike ride and a short walk. Take some great pictures of your kids having fun in the fountain! Coligny Beach Park has wonderful fountains that are fun for all. 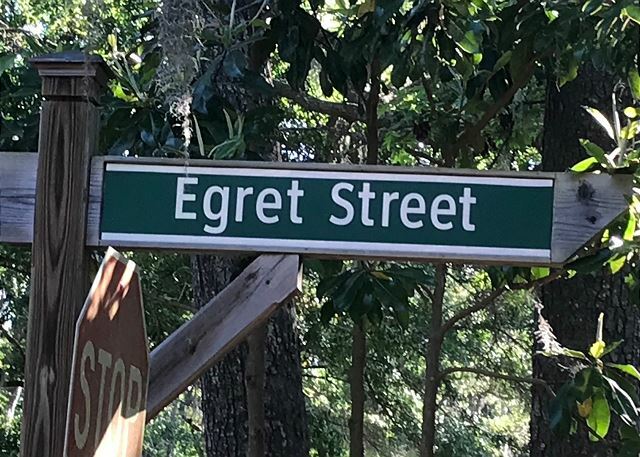 Nestled in the heart of the North Forest Beach area of Hilton Head Island and a three minute walk to the beach is our 6 bedroom 4 1/2 bath beach house we call "Sandy Feet Retreat"
Sandy Feet Retreat has it all! Two houses for the price of one, a large pool which can be heated for an additional charge. This home has had recent renovations; all three bathrooms in the main house have beautiful with walk in showers, new vanities, toilets and light fixtures. New flooring has been installed throughout the main house along with new furnishings. A classic North Forest Beach property in a great location. Sandy Feet Retreat is fun and convenient for every age group. It is on the bike trail, close to the best beach and a four minute walk to Coligny for shopping, dining and entertainment. The main house is a ground level with no steps. Having 2 houses on one property offers ideal space for both family togetherness and privacy. Also for a small corporate gathering and golf groups. What sets this house apart is not only the bonus two-story guest house, but also the outstanding attention to comfort. There is an inviting entrance with a den/living area furnished with a queen sofa sleeper. The Carolina Room extends the length of the main house in back. French doors open to the pool and screened porch. A custom banquette with table that seats up to 14, TV, fireplace, sectional sofa make this a great gathering place for the whole party. The kitchen is completely equipped with everything you need to prepare meals. The covered screen porch is fabulous and has a custom built bar with outdoor seating, comfortable furnishings with a flat screen TV. The screened in porch connects the main house to the guest house. The swimming pool is one of the largest and best private pools on the island. The pool can be heated for an additional fee. Enjoy the waterfall fountain and the wading pool designed for sunbathing on lounge chairs in 18" of water. New chase lounges have been added to enjoy while enjoying the sunny island days. The garage is stocked with toys for your use.Several bikes, beach chairs, beach cart, sand toys, boogie boards, a corn hole toss game. On the side of the home is a shuffle board court and all the equipment. This will be a retreat that your family will make lasting memories in and that you will want to return to year after year. Our family (6 adults and 7 children) had a fantastic Thanksgiving vacation at Sandy Feet. The well maintained retreat is perfect for large families and close to the beach. We’ll be back soon! This was our second time staying at this location. We enjoyed both times. The home is in a great location, and quite comfortable for a large group. Our three generation family had a great time making memories at the beach. We were able to walk or bike to the beach and ice cream store and grocery store. Small issues, like ants outside were taken care of very quickly. You do have to be fairly agile and not too large to stay in the guesthouse. The main house was perfect for the parents and kids. We did find that the grandkids joined the grand parents for breakfast in the guesthouse, which worked out well. The eating areas were large enough for everyone to eat together. One highlight was the two middle grandchildren learned how to ride without training wheel and then took their new skill to the beach! The house was nice, the pool was in full sun and refreshing, the hot tub was exhilarating. Loved having the bikes and the wagon to take to the beach. We had a very enjoyable week!